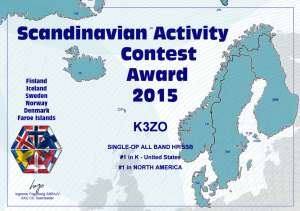 We are pleased to announce the final results for SAC 2015. This year we had a small increase in participants on CW, compared to last year. But in the SSB leg we had a drop of almost 300 logs, probably due to the extremely bad propagation. In total we received 1958 logs. The SAC award has been re-designed with a new look. Download your own award by simply clicking the rank number in the result listing. 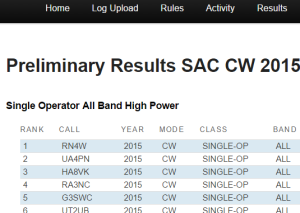 To view your or someone else’s UBN, click on the callsign. A PDF Results Booklet will be released in the near future, including the tabulated results, soapbox comments, and longer contest stories and photographs collected from a number of SAC participants. The SAC 2015 preliminary results are ready. Please check your score! If you find something is wrong email us: support@sactest.net. After five days from now, we will make the score final and also add a list of the plaque winners. We have now added the UBN-files to the preliminary listings. Click on the on the Call in the list, to view the UBN-file.